There is little point in possessing a Ferrari if it doesn't have any brakes. And that is a lesson Saints have learned during the past couple of weeks, which have seen them blown off course in two competitions despite racking up a total of 10 tries. They notched five at Stade Marcel Michelin in a 61-38 European Challenge Cup quarter-final defeat to Clermont Auvergne before scoring just as many against Gloucester on Sunday. But just as against the French giants, they simply could not halt the opposition as the Cherry and Whites delivered an eye-watering six scores at Franklin's Gardens. In a wide open game, Saints will be ruing key moments when they switched off and allowed Gloucester to glide in. Especially just before the break, when a Cobus Reinach score had brought the black, green and gold back to just two points down. It should have breathed new life into their second-half victory bid, but instead, Gloucester cut through Saints again to score a bonus-point effort that moved them seven points ahead. And after Johan Ackermann's men grabbed the first try after the break, Saints had given themselves another mountain to climb. There were still plenty of flashes of class from the hosts, including a sublime try-of-the-week contender from Rory Hutchinson. But again Saints had given themselves too much work to do. They know they can slice through some of Europe's best sides when they are playing with the swagger that has been instilled in recent times. But they also know that can make them vulnerable as they occasionally lose concentration and speed against the counter-attack and in defence in general. Without fixing that, their flashy play will continue to go unrewarded. But the good news is that they won't be playing teams with the quality of attacking play Clermont and Gloucester possess every week. 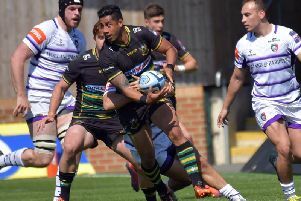 Eventually, Saints, who have been much better in the scrum as the season has gone on, will have to find a way to deal with those streetwise sides and surpass them. For now, they are behind them in terms of the amount of time they have had to rebuild and to develop their own unique style. But the talented group of youngsters will only get better for experiences like this, which boss Chris Boyd labelled 'a bitter lesson'. Saints should still fancy their chances of bouncing back at Harlequins on Saturday, even though their hosts sit seven points ahead of them in the standings. Quins have lost their past three matches and did not look too impressive in those games. Saints will know they can conquer the Stoop with their slick attacking game, but they must now ensure their determination going forward is mirrored going the other way. If it is, the play-off bid will be back on come Saturday evening. If it isn't, the top four will most likely have moved too far away towards the end of a campaign that has been a real roller-coaster ride.